Chinese New Year for 2008 is fast approaching. 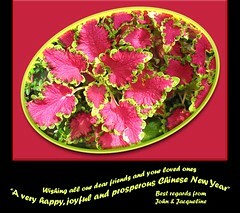 In our country, Malaysia, this auspicious day will fall on February 7 according to the Chinese Lunar Calendar. It will be celebrated by the Chinese communities here and all over the world, especially Chinese populated regions such as China, Mongolia, Taiwan, Hong Kong, Thailand, Malaysia, Singapore, Indonesia, Philippines and others. Year 2008 is identified as the Brown Earth Rat year. Read interesting articles about this festive season at this site. 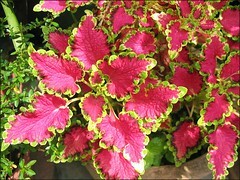 Moreover, I have just the right image to use…a photo taken recently of a Coleus plant in our garden, showing off its gorgeous crimson-red variegated foliage. 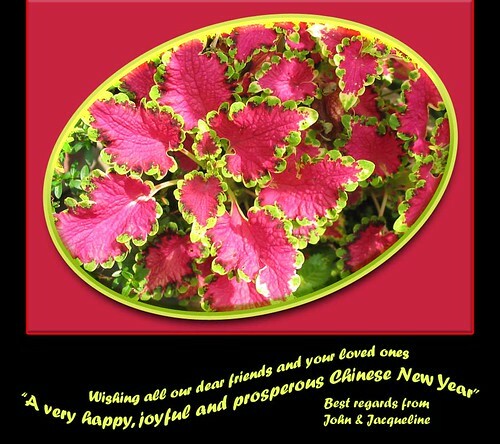 Most appropriate I think, as the color red for the Chinese people represents lasting happiness, good fortune, fame and riches! Not discounting that red is also considered to have the power to ward off misfortune and evil! Step 1. In Photoshop, open the image that you want to use – Choose File > Open and browse to select your image. 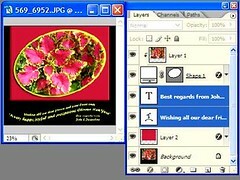 Never work on an original photo, see that you have its copy made earlier and that’s the one to open. 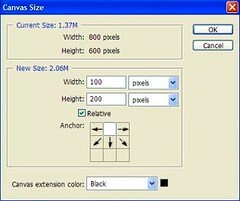 Check image size and if necessary reduce its size to 800 x 600 pixels which is the recommended size for web publishing – go to Image > Image Size and key in the dimensions as you would want the completed image to be. In this example, I’ve chosen this picture which had been reduced to 800 x 600 pixels. Clicking on it will lead you to my Flickr photostream, then click the All sizes icon above the image and download it to follow through this tutorial, if you’re interested. Step 2. 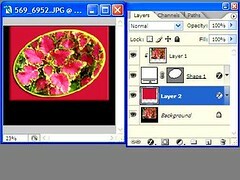 With the Background layer selected in the Layers Palette, you’ll need to duplicate it. Go to Layer > Duplicate Layer > OK or press the shortcut keys Ctrl+J to bring forth a Background copy which Photoshop will automatically name Layer 1. You can either double click on the name to rename it or leave it as it is. Step 3. Next, draw an ellipse shape (sort of cropping a smaller picture). To do this, select the Ellipse Tool from the Tool box on the left (the Vector Shape tools are located directly under the Type Tool), then click and drag it over the image area that you’d want your cropped picture version to represent. If the tool is not visible, click at the location and hold down the mouse button to select your tool from the fly-out list. The shape to be drawn need not be precise, just an approximate one will do since you can transform it later. Once the vector shape is drawn, you’ll notice the appearance of a colored ellipse shape on the image and, in the Layers Palette a new layer (Shape 1) is created with 2 thumbnails – a color box for the layer and another for the vector mask. Click on Shape 1 layer and drag it below Layer 1 to reposition. Step 4. Now, to resize, reposition or rotate your vector shape as desired. With the Shape 1 layer still highlighted in blue (and the vector mask thumbnail highlighted too) in the Layers Palette, press Ctrl+T to bring out the Free Transform box and handles around the cropped picture. To reposition the vector shape, click anywhere inside the box and drag the shape to your desired location, or nudge it with the arrow keys on your keyboard. To resize it, simply click and drag any of the side handles or constrain the proportions by holding down Shift as you drag a corner handle, and holding down Shift+Alt as you drag will cause the shape to resize from the center. Should you need to rotate the shape, move your mouse anywhere outside the box and when the cursor change to a double-sided arrow, click and drag as desired. To complete the transformation, press Enter or double-click inside the Free Transform box. To cancel the operation, press Esc and try again. You can click on the vector mask thumbnail to toggle on and off. (Later, you may need to repeat this step a few times probably to reshape, resize or reposition the vector shape to create a more balanced overall picture with the background). Step 5. You’ll then need to use the vector shape to create a clipping mask before you can ‘dress’ it. This means that it will clip the layer above it into the dimensions of the cropped picture version. To do this, hold down the Alt key and move your cursor directly between the Layer 1 and Shape 1 layers in the Layers Palette until you see your cursor change into the clipping mask icon. Then, double-click to create the clipping mask. You will know that you’ve done it correctly when the Layer 1 is indented to the right, confirming that it’s clipped by the vector shape below it. Step 6. Next step is to frame the cropped image to bring it into focus. Just adding a combination of a few layer styles to its vector shape can create an arty and fancy border. First, click on the Eye icon to the right of the Background layer to remove visibility. (By clicking the Eye icon, you can toggle visibility on and off). Then, with the Shape 1 layer and vector mask thumbnail in the Layers Palette still being selected, click on the Layer Style icon at the bottom of the palette and select Blending Options (or double-click to the right of the Shape 1 layer) to open the Layer Style window. In this example, I’ve applied a Stroke, Drop Shadow and, Bevel and Emboss. (a) Stroke – click on the name Stroke on the left side of the Layer Style window to open its options for you to choose. Check that Preview (on the right side of window) is selected to allow you to view simultaneously the effects of your choices made on image itself. Here, I’ve set the following options: Stroke size – 14px, Position – center, Blend mode – Normal, Opacity to 100% and color #d6e656 (a chartreuse color taken from the cropped picture – click on the color box to open the Color Picker, then use the Eyedropper Tool to select the color from your image and click OK when done). Do not close the Layer Style window yet as there are 2 more layer effects to be applied. (b) Drop Shadow – click on the name Drop Shadow to bring out its options, and select: Blend Mode – Multiply, Color – black #000000, Opacity – 85%, Angle – 100Âº, select Global Light, Distance – 14px, Spread – 0%, Size – 16px, Contour – Linear, deselect Anti-aliased. (Tip – There’s an easier way to set the Angle and Distance options. With the Layer Style window open and set to Drop Shadow, simply click anywhere inside your image and drag your mouse around. As you drag the mouse, you’ll see the drop shadow being created and the values for Angle and Distance changing dynamically. Stop dragging when you’re pleased with the results). (c) Bevel and Emboss – click on the words Bevel and Emboss to open its options, and choose: Style – Inner Bevel, Technique – Smooth, Depth – 100º, Direction – Up, Size – 20px, Soften – 0px, Angle – 100º, select Global Light, Altitude – 30º, Gloss Contour – Linear, deselect Anti-aliased, Highlight Mode – Vivid Light, Color – #f5f98c, Opacity – 70%, Shadow Mode – Multiply, Color – #99bf04, Opacity – 80%. Also, click on the word Contour on the right side of window, and for Contour – pick Linear (click on the drop-arrow to open the Contour Picker to make your choice), deselect Anti-aliased, Range – 50%. (d) Acceptance – View cropped image to see the overall effects of the Layer Styles applied. Enjoy and do not be afraid to try out the many styles and options available! If you want to cancel any styling effect, just deselect in the box to the left of its name, or click on its name to open options and make changes. When you’re finally satisfied with all the styling results made on your photo, save your styling efforts as a New Style (button displayed on the right side) for future use. Then, click OK to accept and close the Layer Style window. Should you change your mind again after exiting, just return to it by double-clicking on the Layer style button (letter f with a circle) in the Layers Palette and make the desired changes. Step 7. Now, to give a solid red color to the surrounding background so that the vector shape will pop up. 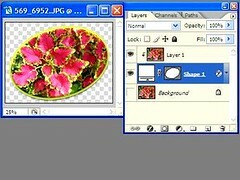 With the Shape 1 layer still being selected in the Layers Palette, press Ctrl key and click on the Create a new layer icon – a new layer (Layer 2) will appear just below the Shape 1 layer. Next, use the Eyedropper Tool from the Tool box (or tap I) to choose a color from your image if you like. In this example, I’ve chosen color #c82341 with the Eyedropper Tool and then paint the background with the Paint Bucket Tool from the Tool box. 1. Stroke: Size – 3px, Position – outside, and color #ff0000 (default – red). 2. Bevel and Emboss: Size – 5px, Highlight Mode – Screen, Color – #ffffff (white), Opacity – 20%, Shadow Mode is the same but change color to black #000000, Opacity – 30%. Click OK when done to close the window. As the position of the stroke applied here is outside, it will only be visible when the canvas size is increased in the next step. Step 8. To give a lovely contrast, I thought it best to increase Layer 2 and paint it black. To do this, click the Layer visibility icon (Eye) to the left of Background Layer to revive visibility. Then, with Layer 2 still being selected in the Layers Palette, go to Image > Canvas Size, and its window will pop-up for your selections. Follow as shown in the illustrated left image below. When done, click OK to close window. Step 9. Finally, to complete the creation of the card with your greetings. Select the Type Tool from the Tool box or Tap T to bring up the Text options bar at the top of Photoshop window, to make your selections. In this example, I’ve set the following for font – Forte, Regular, Size 11pt, Sharp, Center align, and color #eafd56. 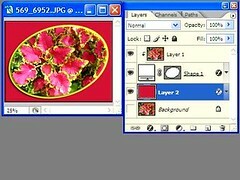 Click on image, approximately where you want your words to start, and you’d notice that a new layer (Layer 3) is added in the Layers Palette. It need not be precise as you can reposition the words later. Type your greetings and should you want to undo while typing, press Esc (or click the Cancel button in the top options bar) and retry. To reposition the words, press Ctrl and hold which will bring forward a bounding box and a pointer, and together with a left mouse-click, drag to position as desired, and release to accept the shift. To accept the current edits, click the Commit icon at the options bar. Once accepted, you’d notice that Layer 3 is now renamed with a portion of the typed words. Looking at the result, you as I did, may want to change the font size of the second line to 14 pt and warp the whole greetings to make it more interesting. So, click and select the relevant text to change the font size at the options bar. Then, select the whole text to be warped – click the Create warped text icon at the top which will bring up its window, and make your choices. Here, I’ve selected for Style – Flag, Horizontal and Bend – 100%, then click OK to close window. Very likely, you may need to reposition the text as in this example – so follow the same process as mentioned previously. To accept all the edits, click the Commit icon. Should you want to undo, just press Ctrl+Z and try again. Taa..daa! Here’s the final result! What do you think? the card is nice . thnx 4 posting this tutorial. Thanks for the thumbs up, Arjun! Delighted you like it. And, you have a joyful and blessed 2010 too! there are many greeting card options that you can see in online stores but i love those that generate cute sounds ~;.